Do You ‘Gotta Get The Bread & Milk’? The New York Tri State Area got hit with lots of snow last night into this morning and with snow comes panic. 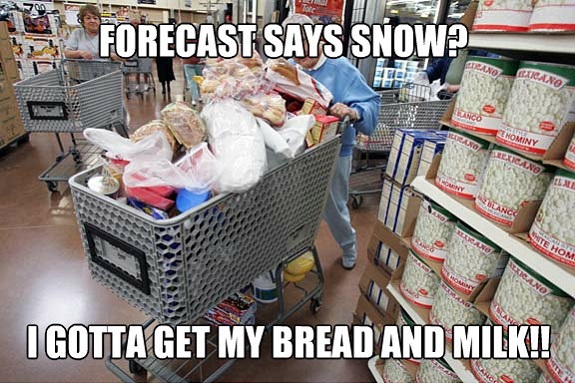 What you don’t panic before a storm buying up everything in the supermarket? I can tell you from personal experience, they are out there. If you are not one of them, I am sure you either know someone who is or at least have been in the supermarket with one of these people. Thanks to Comedian Vic Dibitetto who posted this clip to YouTube. He documents an epic journey to get the, “bread and milk.” So far the video has over 10 million views.